It is always a good habit to create an Agreement Form when starting up a new business relationship to ensure that two meeting parties are on the same page. 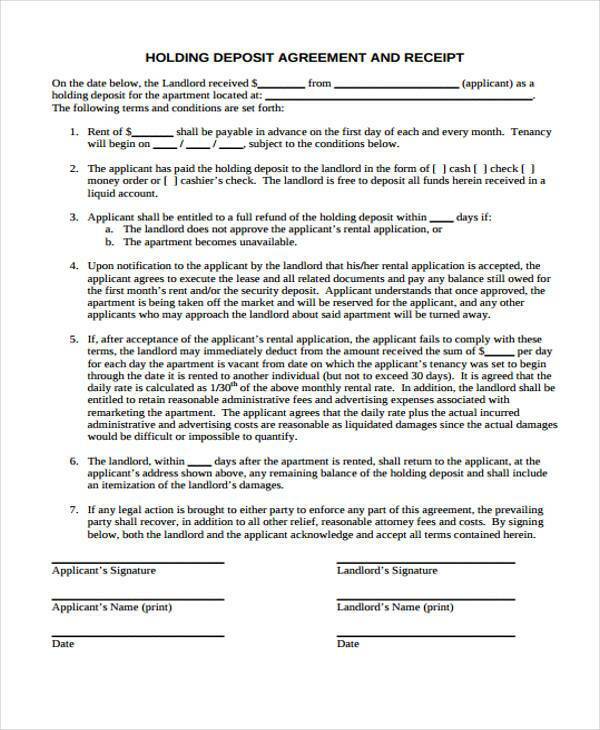 A Holding Deposit Agreement Form is an example of an Agreement Form wherein a landlord or a letting agent reserves a rental property before signing the agreement after a sum of money is paid. As an anticipated tenant, you should expect to be asked for a Holding Deposit from a landlord or letting agent to reserve a rental property. 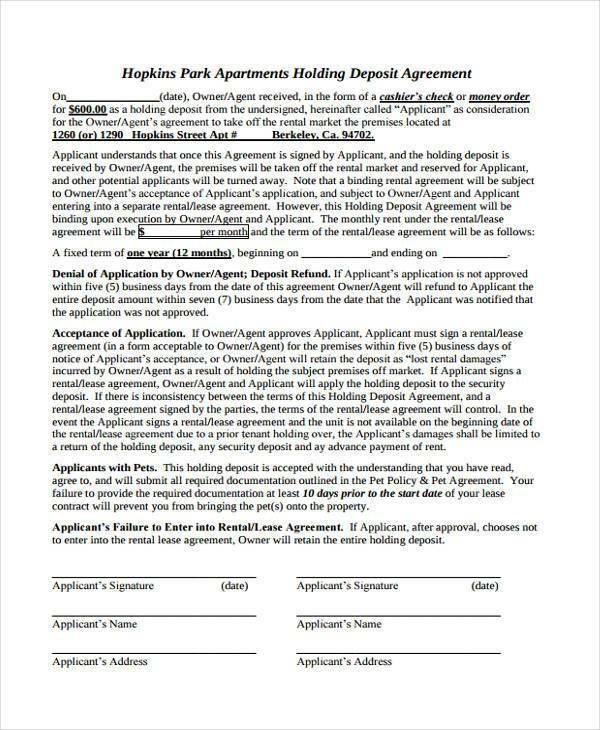 A Deposit Agreement Form, also called a Bank Investment Contract, is an agreement between a bank and an investor where the bank provides an insured rate of return in exchange for keeping a deposit for a fixed amount of time. 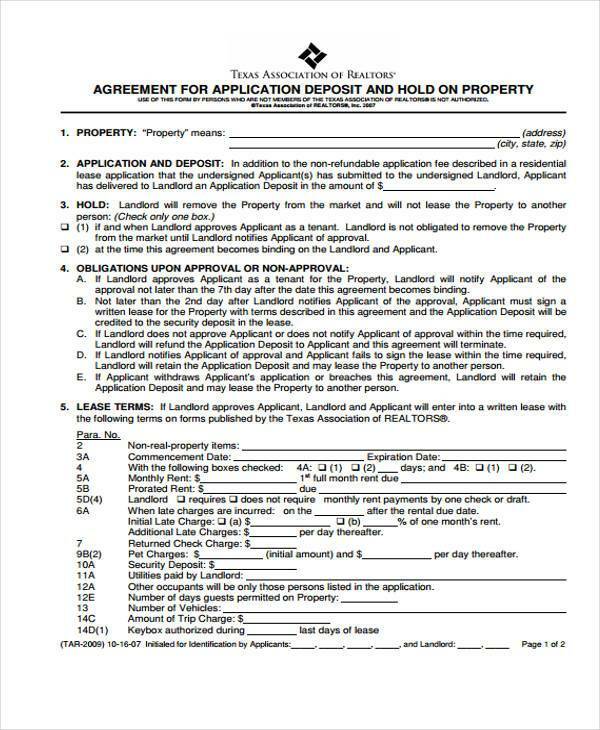 What Is a Holding Deposit Agreement? 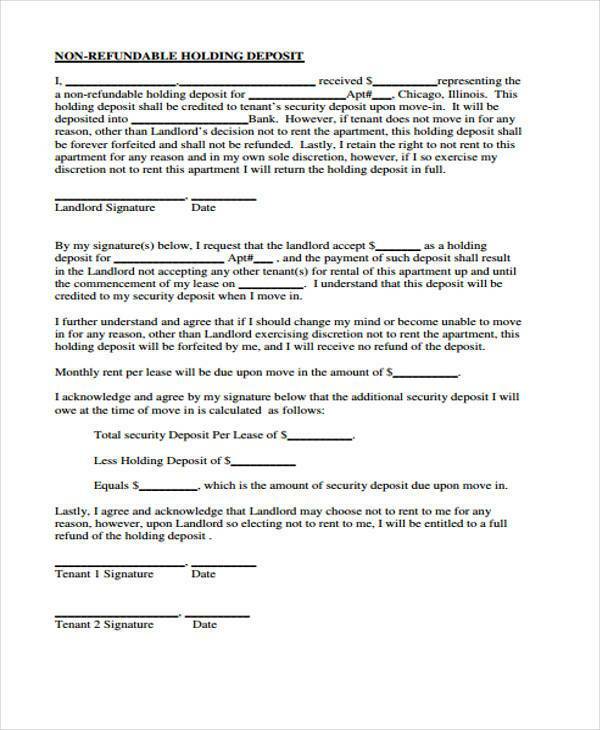 A Holding Deposit is an agreement in which a sum of money is paid to a landlord or letting agent to reserve a rental property before the signing of a tenancy agreement. It is completely separate from a tenancy deposit or security bond. If you were to withdraw your application for tenancy, a Holding Deposit is unfortunately non-refundable. A Holding Deposit does not need to be registered under the tenancy deposit rules as it is not held as security in respect of a tenant’s liabilities. Unlike a security deposit, a Holding Deposit can be kept in whole or in part if the landlord keeps the apartment open because of the tenant failing to move in as agreed upon. But just as with a security deposit, the landlord is recommended to show acquired damages for holding the rental unit. 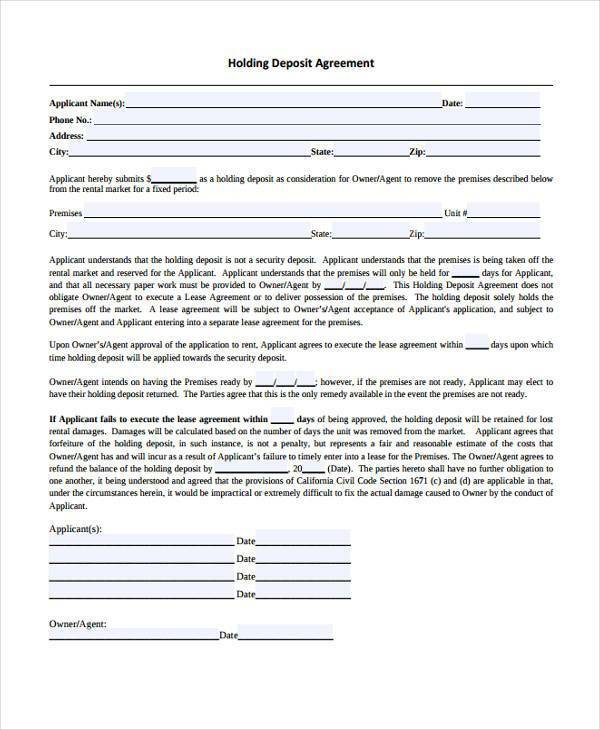 Legal contracts that are mostly found in all types of businesses that require a buyer to purchase a product and a seller to sell a product or service are called Purchase Agreement Forms. 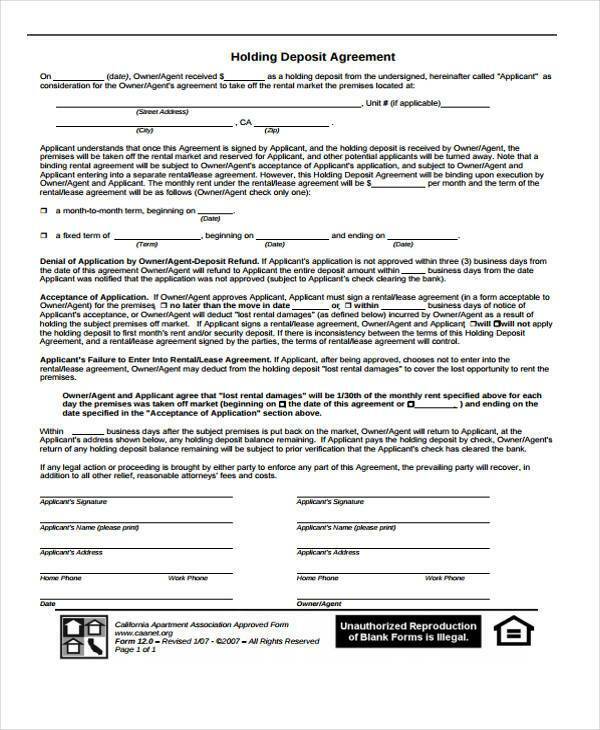 These forms are usually associated with real estate deals as a way of finalizing the interests of both parties before closing the deal. Why Pay a Holding Deposit? 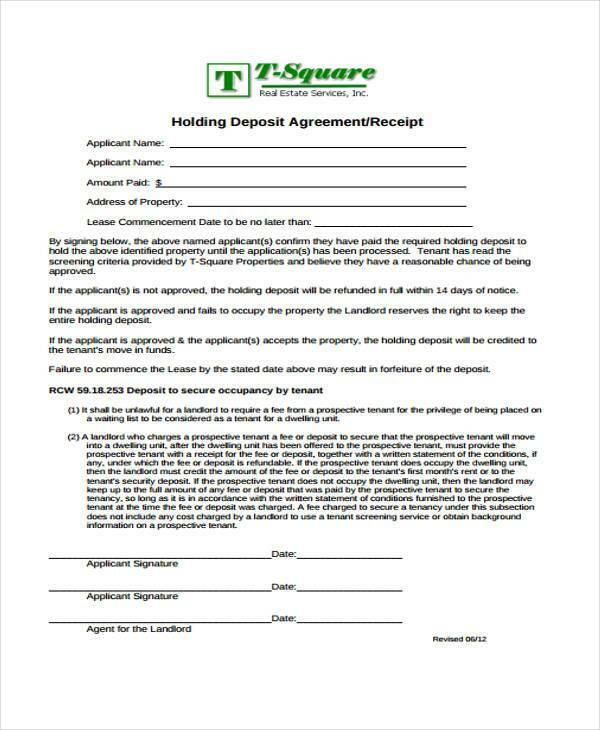 The Holding Deposit payment is made with the intention of “holding” a rental property to show that you are sincere in your tenancy application. In this world, money talks and some prospective tenants never follow up. Therefore, you should expect to pay a Holding Deposit to imply that you are serious with your wanting to rent the property. 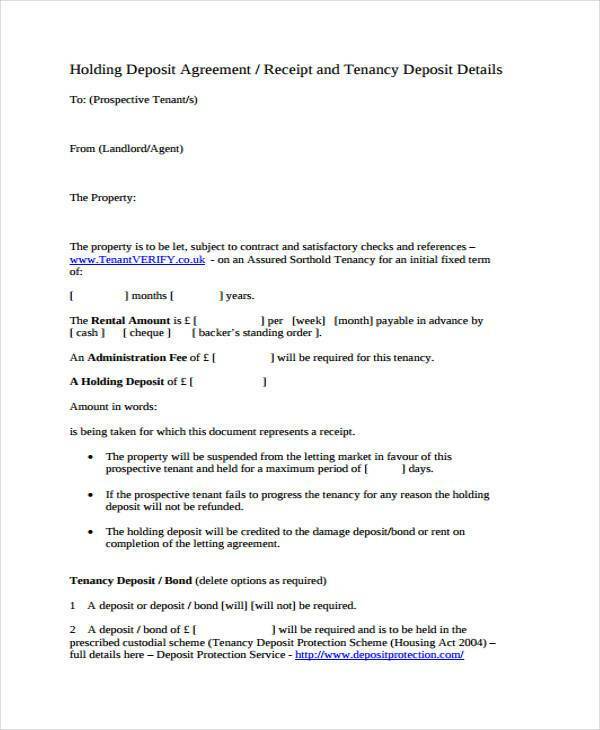 Once the letting agent or landlord has received a Holding Deposit together with the Holding Deposit Agreement Forms, supporting documents, and proof of identity, the property will normally be placed on “hold” and all future viewings will be cancelled until your references have been completed. When to Pay a Holding Deposit? A Holding Deposit should only be paid once you have found a property that suits your requirements and you are sure that you want to proceed with a tenancy on that property. At the same time as you are completing your Tenancy Application Forms, you will then be asked to pay the Holding Deposit. 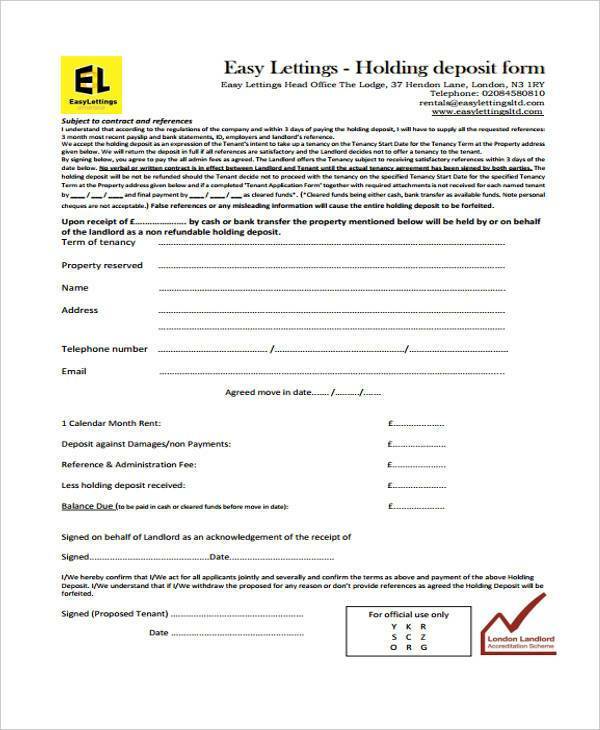 It is recommended that you complete the forms first if you are required to complete a tenancy application, and ask your letting agent or landlord to check through the forms. Only pay the Holding Deposit once they have verified that your earnings are enough to keep up and maintain the requirements.